Pascaline , a machine capable of adding and subtracting nine-digit numbers. Figures were entered by moving numbered wheels linked to each other by gear, similar to a modern automobile's odometer. In 1671, German philosopher and mathematician Gottfried Wilhelm Leibniz improved Pascal's design, creating a machine that performed multiplication. In 1820, Frenchman Charles X. Thomas devised a machine that added subtraction and division to a Leibniz-type calculator. 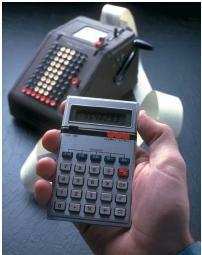 It was the first mass-produced calculator, and it became a common sight in business offices.